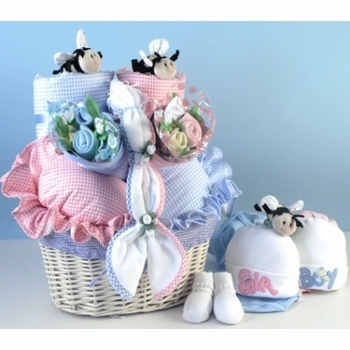 Flowers and bees accent this delightful twin’s basket filled with two of everything - perfect for adding some fun to the new arrival's celebration! Delivery of this made in the U.S.A. gift is free, plus we include complimentary gift wrapping. Comes ready to thrill mom and dad!